A great evening was had by all who attended last nights NY Video Meetup, held at NYU's Vanderbilt Hall. The event was especially interesting for us, as Brightcove CEO, Jeremy Allaire, was the night's featured "hot seat" guest. Jeremy shared his thoughts on the online video landscape and the overall maturity of the market, as well as new trends that are shaping the industry around long-tail, video advertising, premium content, distribution, monetization and marketing. Yaron Samid, the organizer of NY Video and the host of last night's event, also put Jeremy through an "Inside the Actor's Studio" style Q&A session, ranging from topics like his high school days in Minnesota to how Jeremy's first company, Allaire Corporation, was born. Overall, it was a fantastic event that generated interesting discussion and questions. We're thrilled that so many people were able to attend. 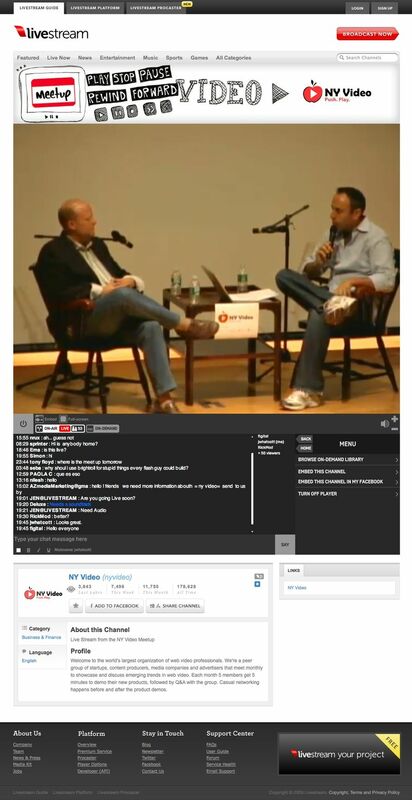 Special thanks to Yaron and his team for organizing such a great event, as well as our friends (and partners) at Livestream for providing a live feed to the event on the NY Video site.